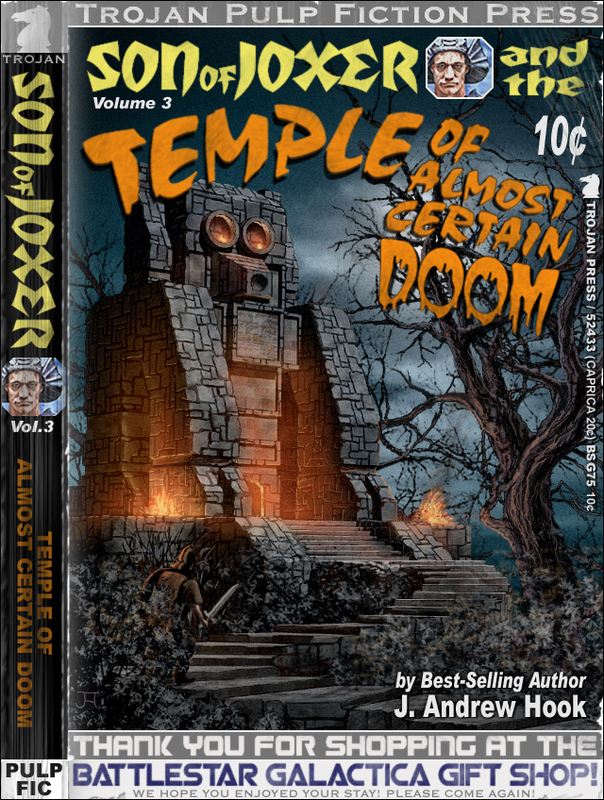 Son of Joxer and the Temple of Almost Certain Doom! If you're still wondering how long it would take Son of Joxer to realize that he's been cursed with immortality, rest assured that watching his beloved wife, Gabriella, die of old age while his own youthful visage remained intact was a difficult clue to overlook. Distraught by this unforeseen turn of events, Joxer contemplates suicide but loathes the idea of giving the gods the satisfaction of taking his own life. Instead, he decides to seek out a new life filled with danger and adventure in the hope that his mortal existence might someday meet with a noble and glorious end. Hence, Joxer decides to "start small" by purging whatever evil resides within the local Temple of Almost Certain Doom. 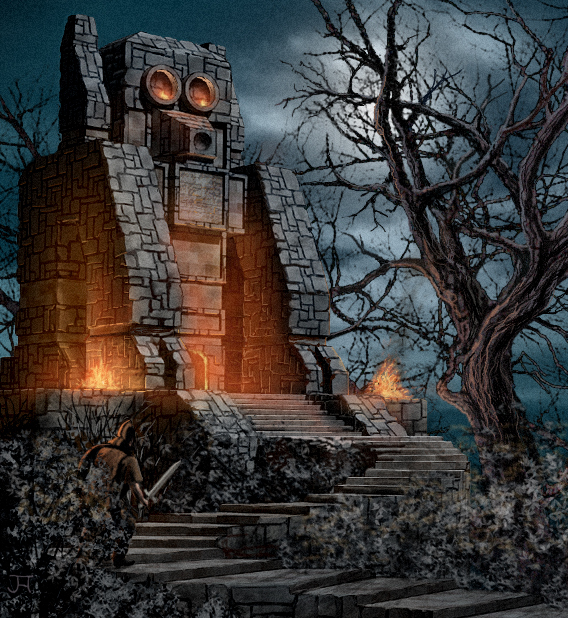 To verify that the temple represents a challenge worthy of a true hero, he watches closely as adventurers and treasure seekers from the surrounding countryside charge directly into the temple's open maw, never to be seen or heard from again. Tired of waiting for people to report back as to what specific dangers lurk within the temple mount, Joxer turns to drink to steel his frayed nerves. post a proper night watch, none of them can be seen guarding the temple gates. If anyone knows about almost certain doom, it's yours truly. And, as an expert, I really wanted to like this book. Sadly, it is utterly and completely unlikable. I was expecting to relate to the hero in the very profound and personal way: after all, we are both cursed with special destinies, both reluctant to take our paths, and both suffer from ambiguity. However, in the end, the trials and tribulations of Son of Joxer have left me empty and dissatisfied. If you think about it, what are his problems? He is immortal? Well, boo-bloody-hoo! Give me immortality any day! And, as any cylon worth their silica will tell you, not being able to die or age is a feature to be embraced and to thank whatever single or multiple deities you are currently worshipping! His wife grew old and passed away? Throw the old girl a frakking state funeral and get yourself a younger model! It's a healthy and respectable thing to do, just ask Colonel Tigh. About the stupidest and the most irrational thing you can do is to go seeking an almost certain doom. For starters, it's almost certain. Almost is not certainty, and you'd think someone who's lived for a while would realize that. Even if he does live in the perpetual state of youthful stupidity. This stupidity is clearly responsible for his suicidal thoughts. You are immortal, moron! You can't die. And what's the fun of causing untold pain to yourself if the end result is not the blissful finish of it all? The one aspect of the Joxer's journey I find relatable is his drinking problem. Personally, that's the kind of problem I can always get behind, and delusional drinking is the best. The visions that it summons are certainly as good as the sweet oblivion he is seeking. And that's without an "almost"! All in all, the book disappoints on several levels: as a meaningful guidance to those of us who crave direction, as an entertaining escape from the toils of this world, and as well-written study on the evils of the gods, humanity, and other life forms. Where it doesn't let you down is the heft: it works beautifully as a decorative door stop, and it can serve as a weapon if thrown with enough strength and velocity.